Commercial freezers are an integral part of many businesses. In bakeries, grocery stores, restaurants and more, they’re a key part of day-to-day operations, which means employees routinely enter and exit them, occasionally spending time within them for a variety of reasons. What this means, above all else, is that you need to have strict oversight of any and all safety features of your commercial freezers in Florida. Door latches: Door latches are one of the most suspect areas of your freezer and demand the utmost attention. Because they’re a dynamic piece (movable parts) and used constantly, they’re prone to breakdown and malfunction with such persistent use. If latches become damaged, they may not lock, or worse, become jammed when they do lock. This can lead to being trapped inside or stuck outside your freezer! Thermometers: Maintaining consistent air temperature is important not only for the integrity of your inventory, but also for preventing melting and refreezing. If your thermometer cycles and condensate is allowed to melt and refreeze, you’re going to end up with ice patches that invite slip and fall cases. In a commercial freezer, this is a leading cause of injury and grounds for a potentially costly lawsuit. Load-bearing shelves: It’s crucial to make sure your load-bearing shelves are always monitored for their integrity and security, and to make sure they’re not being overloaded. Metal is treated to perform in low temperature conditions, but it can become brittle nonetheless. If your shelf is compromised, everything atop it could come tumbling down… right on top of some unsuspecting employee. Lights: Your walk-in freezer needs to have proper lighting so anyone working within it can see what they’re doing. All it takes is for someone to bump into something or drop something and you’ve got an injury situation on your hands, made all the worse in a dark, cold, enclosed space. Make sure your light bulbs are always checked and properly serviced. Alert sensors: Every commercial freezer needs a way to alert you that something is wrong. “Door ajar” sensors and temperature alerts are the prime way to do this. If your sensors aren’t working, however, your freezer could be compromised for an extended period of time, leading to a host of safety issues. Be sure to check and have all of the above items serviced by a trained professional. 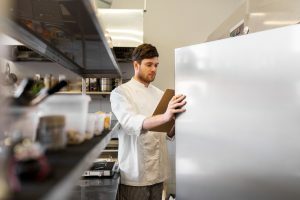 Maintaining your commercial freezer in Florida will help make sure it’s always a safe place for employees to work in and around. Plus, routine maintenance will prevent larger issues from developing—ones that could pose major safety concerns and come with major repair costs.